In my last positioning post, I discussed the four key questions you must answer if you want your positioning research to lead you to effective brand positioning. So how exactly do you discover the answers to the four key questions? Do you need to hire an expensive market research firm and spend hundreds of thousands of dollars on surveys and focus groups? I always answer that question with an astoundingly simple approach that became the backbone of our entire brand strategy during my time at Red Hat. I call it the low-cost, high-value approach, and if you were to illustrate it, it’d look something like this. 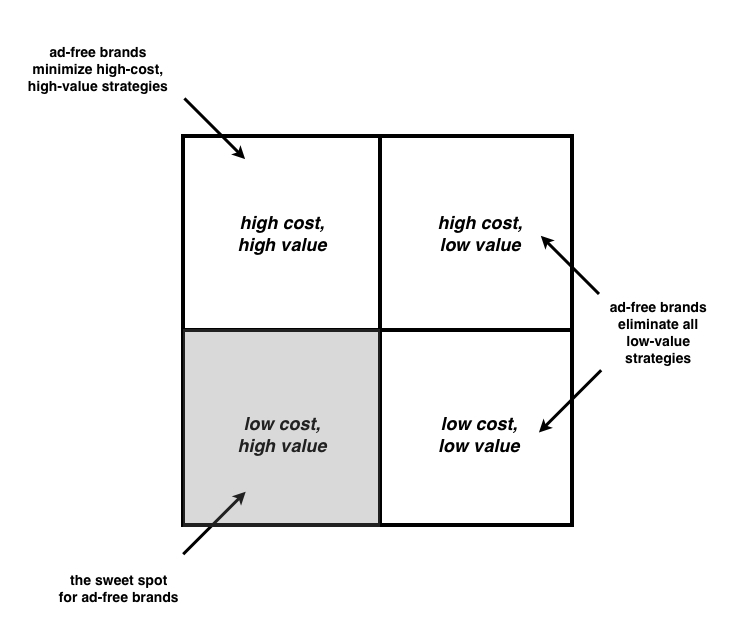 The low-cost, high-value approach means that you always analyze potential strategies in terms of their cost and value. You then default to choosing strategies first that are inexpensive in terms of time and money yet bring you a lot of potential value, before selecting strategies that cost more, even if they bring you great value. For example, hiring a research company to set up a brand tracking study with 10,000 potential customers for your brand might provide you with a lot of useful information (high value). But the study can also cost you a lot of money and take up a lot of your team’s valuable time (high cost). If you have the time and money, you might still decide to field the high-value brand tracking study, but only after you have exhausted all of the low-cost, high-value strategies that might help answer those questions more inexpensively. So, the essence of the low-cost, high-value approach is to default to spending as little time and money as you can and consider high-cost strategies only when there are no other options that will get you the information you need. You’d be surprised how many organizations are essentially blind to an entire category of low-cost, high-value research options because they prefer to stick to practices they used in the years before better options became available. The reality is that the last 10 years have given us a variety of low-cost, high-value digital media tools and resources that are perfect for doing brand positioning research and for rolling out positioning effectively. We now have low-cost, high-value alternatives that can provide data that helps us effectively position brands, many of which were not available before the Internet. Doing research for positioning a brand is less expensive than it has ever been in history. Some people just haven’t received the memo. So how much should you spend on research? When you keep the low-cost, high-value approach in mind, the answer to this question should be clear: balance the amount of time and money you put into the research with the value of the brand you are positioning. If you are trying to position a small web-based business just getting off the ground, you might attempt to answer the four questions with data you already have at your disposal. Perhaps you’ve already done some customer surveys; you’ve just completed a formal business plan; or you and your team even have strong, well-informed ideas about the direction you want to take the brand. You can use all of this preexisting information to answer the four critical questions I listed in the previous post. But if you are attempting to position or reposition a brand where the stakes are high, especially if the brand is already generating significant amounts of revenue, the information you have at your disposal might not be enough. If the stakes are high, but your time or money is short, don’t despair. The ad-free brand positioning approach really shines in low-budget situations because you can always take advantage of the “release early, release often” principle that this open, transparent positioning process embraces. Don’t have any money to invest in research? You can still create a starting brand position by answering the four questions with the best information you have at your disposal. Then immediately start testing the positioning with others in the organization and potentially even in communities outside the organization. Incorporate the feedback, revise the positioning, and try again. So if you are positioning a small brand, please don’t feel like you need to break the bank doing research. If you consider the low-cost, high value approach while always keeping the investment you are making in line with the value of the brand you are trying to position, you’ll be nicely set up for long-term positioning success. This is the fourth in a series of posts drawn from the current draft of my new book The Ad-Free Brand, which will be released in August 2011 and is available for pre-sale now on Amazon.